The prolonged road trip finally seemed to take its toll on the Belfast Giants as they saw their 11-game domestic win streak snapped in a 4-2 loss at bitter rivals the Sheffield Steelers. Having played 14 consecutive domestic games away from home, it finally appeared to hit the Giants, who came out sluggish and found themselves four goals down by the half hour. It was two former Giants who did the damage for the Steelers, former forward Robert Dowd scoring twice, while netminder Jackson Whistle made 28 saves as Belfast tried to fight back in the third period. 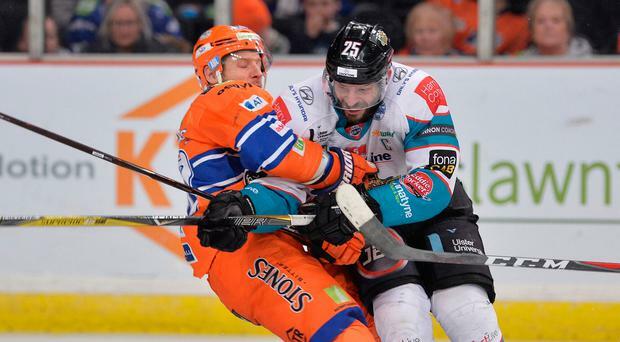 It means the two sides split their weekend double-header, with the Giants winning 4-2 on Saturday night, and they stay top of the Elite League despite this loss, however their lead has now been cut to just one point. But this was a game that the Giants did themselves no favours in. From the start they looked off the pace, with Justin Buzzeo nearly finishing a pass to the crease inside the opening seconds, and it didn't take long for them to strike twice. Dowd's two goals were almost identical, the first coming at 4:00 when the Brit finished Josh Pitt's pass from behind the net, while his second at 6:35 saw him drive in Jonas Westerling's pass from the sideboards. Indeed, it could have been a lot worse by the first intermission had Tyler Beskorowany not denied Ryan Martinelli and Tanner Eberle short-handed, both having one-on-one chances that the goaltender blocked away. But the rearguard collapsed early in the second period, in rather unfortunate circumstances, as the Steelers added a third at 23:07 when Giants d-man Josh Roach redirected Josh McFadden's shot into his own net. And after Darcy Murphy somehow missed an open cage to get the Giants on the board, he then took a penalty shortly after Kyle Baun did the same to give Sheffield a five-on-three, and Ben O'Connor capitalised by firing in a slapshot for the fourth at 28:54. Roach hit the bar before Francis Beauvillier finally got Belfast off the mark at 34:49 when he roofed the puck following Jonathan Ferland's pass back in front. The Giants dominated the start of the third period, however they couldn't find a way past the resolute Whistle - impressing against his former employers - with David Rutherford, Baun and Beauvillier all going close. Blair Riley did at least ensure it would finish a two-goal game with his snipe from the slot on the powerplay with 57 seconds to go, but it was scant consolation.